Wireless broadband (also known as Wi-Fi) is broadband transmitted via a router. It allows multiple users to access a broadband connection wirelessly throughout their house or place of work. How do wireless routers for broadband work? A wireless router converts and broadcasts the signals coming through your telephone wire around a fixed area, working on the same principle as a cordless home telephone. The broadcasted signal is then picked up by wireless-enabled devices, such as laptops and gaming consoles, giving you wireless broadband connectivity throughout the house. That said, if you do get stuck, most ISPs provide immaculate support to help you set up your home wireless network as painlessly as possible. The term 'wireless mobile broadband routers' can also refer to gadgets that let you get online while you're out and about. These are usually described as MiFis or MiFi units, which create a localised wireless signal that can be shared among multiple devices. MiFis are available with Three, EE, O2 and Vodafone. 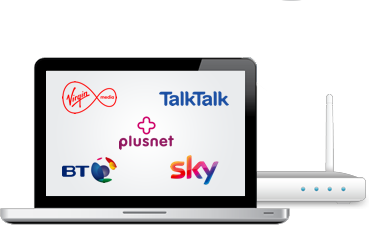 Compare bestselling packages for wireless mobile broadband here. If you are struggling to get up and running with wireless broadband at home, refer to our guide about wireless broadband problems.